How Many Miles is Too Many for a Used Car? It's probably no secret at this point that I'm a huge fan of driving used cars rather than financing brand new ones. New cars are just so expensive these days, and the amount of debt that people take on to get them just doesn't seem worth it to me in the grand scheme. I'm not saying that people who buy new cars are fools or anything like that, because there are plenty of reasons to drive a new car if you really want one, but driving used instead could be a huge help to your finances if you want to go that route. The great thing is that you can buy a really nice used car for a fraction of the cost and still have it last a long time. My wife and I have been driving used cars for years now, and even as my income has risen we haven't changed that habit. We'll continue to drive used cars well over the 100,000-mile mark for the foreseeable future. But if you’re going used, you do need to know how many miles is too many for a used car. There are actually a lot of cars that can hit 200,000 miles these days, but at the same time, some cars turn out to not be very reliable. I plan on driving my 2004 Yukon XL past the 200,000-mile mark, and I'm currently sitting at about 140,000 miles. Alright alright, I’ll explain. One of the reasons I'm not a huge fan of new cars is that they start losing their value the minute you sign the paperwork. According to Carfax, in the first month alone, a new car will lose 10% of its value. And after a year, your shiny new car will have lost 20% of the amount of money you bought it for. Say I bought a brand new Yukon tomorrow, going big and getting the ‘19 Denali. MSRP on that is $70,595, and that doesn’t include taxes, title, options, dealer fees, etc. A month from now, that Denali will be worth $63,536. After a year, only $56,477. That's a lot of money that just vanished, right? When I buy used, I’m minimizing the damage by letting someone else take that depreciation hit for me, then I’ll buy that used car at a lower price. I’ll still be losing some money, but not nearly as much. Buying used would save me nearly $40k right off the bat. Pretty awesome, right? When you’re shopping for a new car, you might see that MSRP and think “hey, I can afford this!” Stop right there. There are considerably more cost factors than just that MSRP. The more expensive the vehicle, the higher the taxes and the more it’s going to cost to insure. And the biggest expenses, unless you have cash, are going to be a ton of finances charges you’ll be paying. There are so many awesome used cars out there, and the average American buying a new car is going to be tied to a huge monthly payment for 3-5 years on something that is constantly depreciating. If you’re trying to get out of debt or stash money away for the future, it's just not a very effective strategy. When you look at those used options I found, you’re probably looking at the mileage as well as the price. So how many miles is too many for a used car? The miles on the odometer basically tell you how much of its life a car has lived, and with routine maintenance, many cars can “live” to 200,000 miles. When you consider that the average American puts around 14,000 miles on their car a year, give or take, then you can think about how many more years a used car has in it. If I went with that 2011 Denali with approximately 78,000 miles, then I can reasonably guess that it will last for nearly nine more years. That’s not bad at all. Still, how many miles is too many for a used car? Sorry guys, there’s no clear answer on this. But if you take that 14,000 miles a year average, you can make a pretty educated decision when used car shopping. In those examples above, look at that 2015 Yukon with approximately 67,000 miles on it. It’s only three years old, but it’s been driven considerably more than 2011, so it’s still only going to last about 9-10 more years. When you’re shopping around and wondering how many miles is too many for a used car you’re considering, keep in mind how many miles you put on your car every year. I actually drive a little less than 14,000 miles a year, but knowing how many miles you put on your car a year will help you make a decision. Even with that 14,000 miles a year, between the 2015 and 2011 Yukons, based on mileage alone, I could easily go with the older one and save 15k. Not everyone is going to want a Yukon, of course, but it’s pretty easy right now to find cars that are known for reaching that 200,000-mile mark. Most of those are SUVs, but their website compiles lists for different types of vehicles, from cars, trucks, and luxury vehicles. Those cars are known for holding their value too, and that’s because of how long they last. Keep that in mind when you’re shopping for a used car. If you’re wondering how many miles is too many for a used car, know that not all cars are known for making it as long as those. 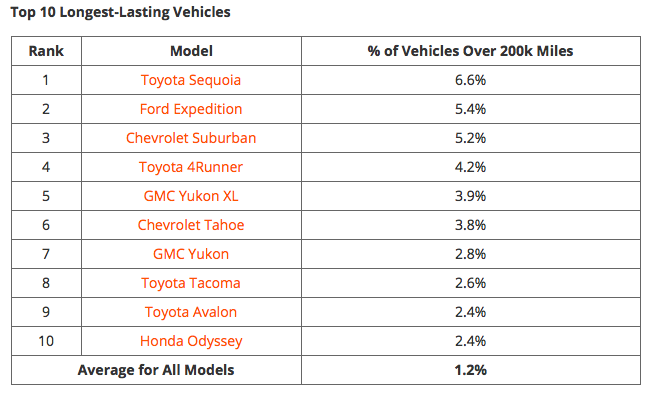 Like I said, there isn’t an obvious answer to the mileage question, so make sure and do your research on the models and years you’re looking at. There are a lot of people like me on the internet who love talking about cars, so the information is out there. Part of the appeal of new cars is that they’ve never been driven and come with a warranty. I know a lot of people who use that argument. That’s fine, but it’s not hard to find a quality used car for much less than a new one. Know that you will find a better deal when you go through a private seller, especially if you have cash on hand. Point out every single flaw to the seller and use those to negotiate for a better price. Find out the car’s history. If they bought it new, then they likely had routine maintenance done through a dealer and will be able to provide receipts. Research the make and model in advance so you know what kinds of common issues it may have, then ask about those. When you find something you like, spend $30 on a Carfax report. You can even pull it up on your phone while you’re looking at the car. If you’re looking at the miles and wondering how many miles is too many for a used car, pay more attention to how the car has been maintained. For more information on what to look for in a used car, read How to Get Rid of Your Car Payment: The Ultimate Guide. Routine maintenance folks, it’s just that simple. Despite the low cost, used cars are still going to cost money. Cars, in general, are money losers. That's just the reality of the situation. All you can do is try to control how much money is lost over the course of ownership. Inspect it on your own. Check the tire pressure every month, make sure your tires have a decent amount of tread left on them, check your fluids, and pay attention to any funny sounds. Read your manual. Your car’s manual will tell you the exact levels of fluid you should have and it will tell you where all of them are housed. It also tells you when you should be replacing filters. Never ignore a leak. When you pull out of your driveway, see if anything has dripped out. If you’re like me, then you can sniff it and get a good idea of what it is. If you’re lacking that valuable skill, bring it in when you notice a leak. Check your belts. Serpentine belts and your timing belts are important components to check on. Timing belts need to be replaced every 60,000 miles and serpentine belts need to be replaced every 40,000 miles. Get your oil changed on the reg. This is pretty easy to do on your own, but don’t skip bringing it to a mechanic if you need to. Shops are always handing out coupons for oil changes if you don’t know how to do it yourself. I've actually found that it costs about the same to take it somewhere when they are doing a special as it does to do it on my own. Check your battery. I bet you all know what a car battery looks like, so pop the hood and check for corrosion. Clean the contacts if needed. Change your spark plugs if they look worn out or are covered in build up. Deal with your tires. Get your tires replaced, rotated, and balanced as needed. This is a safety issue, so don’t ignore it. I actually need to take mine it soon to get the tires rotated, so this is a good reminder. Like I said, there’s no clear answer to the question of how many miles is too many for a used car, but know that 100,000 miles on a used car is not the end of the world. You don’t need to finance a new car every 4-7 years. If you do your research and maintain the used car you buy, you’ll be able to pocket that difference between a new and used car. That’s my plan. What do you drive and how many miles? Couldn’t agree more, I am slightly early retired with millions invested but my daily driver is a 2008 with 172,000 miles. I’m shooting for 200,000 on it though the previous car I had, just like it, blew the engine before hitting that mark. But I only paid $7,000 for this one so if it blows up it is disposable. My sister is still driving the Toyota Celica I gave her and it has 260,000+ miles on it! And there has been no major repairs yet. I’m a Toyota guy for life. I drive a 2004 OLDsmobile Alero, 150k on it currently. I looked up some forums on the car (great place for info and parts btw) and found that some people were able to get 300k out of their Alero’s. We recently had about 1,000 worth of work done to it (water pump, rotation, oil change, coolant tank fix) and honestly, the car is only worth about that…which is when you are supposed to trade it in. But it’s been reliable, and I know who owned it before me…so we are going to ride this thing into the ground. Actually, for the kind of money you’re making, you should buy a ’19 Denali (not used). I used to share your thought process on used cars, and always drove something old. However, a ’19 Denali is over 6k gvw, and is a straight line 100% section 179 deduction in year one, even if financed. I’ve had great luck with buying slightly used Subaru Outbacks. I’m on my second one and LOVING that it is paid off! My goal is to keep it until it is at 200K on the clock, which is totally doable on this model. I’m all over the maintenance which is a small price to pay periodically relative to being saddled with a payment for many years. Buy a car with a reputation for durability that’s about 3 years old. That way someone else has taken the depreciation hit during the first 3 years of it’s life.